Pema Shelpuk (Tib. པདྨ་ཤེལ་ཕུག, Wyl. pad+ma shel phug), the 'Lotus Crystal Cave' — a famous pilgrimage site located at about four hours' trekking distance above Dzongsar Monastery. It is counted as one of the twenty-five most important sacred places in all of East Tibet, representing the enlightened speech aspect of enlightened qualities. 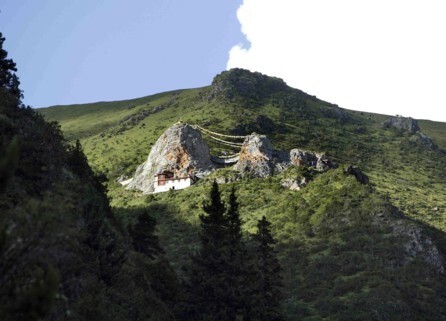 It is said to have been blessed by the four masters Garab Dorje, Shri Singha, Guru Rinpoche and Vairotsana. It was there that Chokgyur Dechen Lingpa discovered the Three Classes of the Great Perfection (Dzogchen Dé Sum) terma cycle, and Jamyang Khyentse Wangpo placed a statue of Guru Dewachenpo in the cave. Jamyang Khyentse Chökyi Lodrö would often stay there in the summer. Surrounded by white mountain cliffs, the valley of Meshö is like an open lotus flower and the foothills covered with meadows and forests. Flowers grow abundantly in summertime and water flows here and there. In the middle, the heart of the lotus, is a huge white rock with a cave in the center called Padma Shelpuk, the Lotus Crystal Cave. The rock, cave and surrounding area are all white in color. The cave contains many naturally appearing images and letters. Yeshe Tsogyal practiced in a small cave to the left, which has windows which also appeared naturally, though they look man-made. The practice caves of Vairotsana and Shri Singha with their naturally-appeared thrones are at the top of the rock. The Padma Shelpuk, which people called the Ghost Cave, was a cave no one dared visit. Whoever went there was eaten right away. People sometimes saw a one-eyed woman they said was the ghost. A bald-headed man riding on a goat was also seen. ↑ Orgyen Tobgyal Rinpoche, The Life of Chokgyur Lingpa, Rangjung Yeshe Publications, 2000, page 8. This page was last edited on 14 December 2017, at 00:39.